I was having a major sweet craving the other day, and we happened to have some puff pastry in the freezer, so I made Palmier cookies! 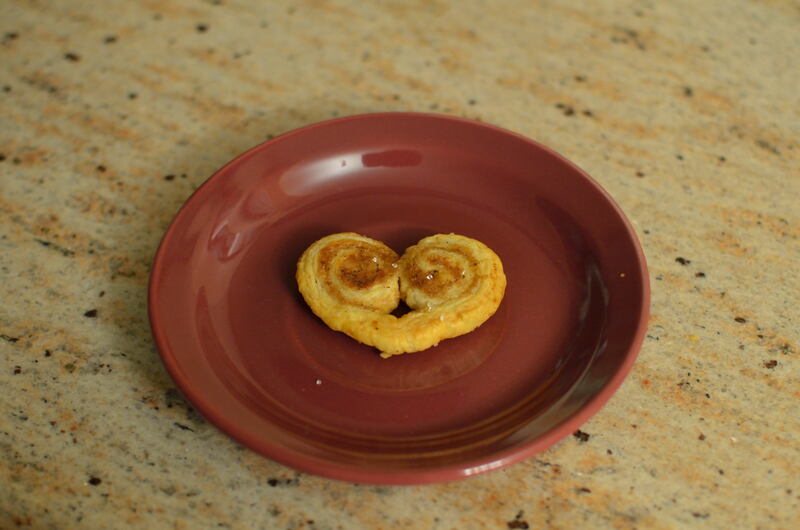 In India, they sell these suuuper yummy mini palmier-type cookies called “Little Hearts”. The only issue is that I haven’t been able to find them here, yet. So, I thought I could recreate them at home! This is honestly the easiest and most impressive-looking cookie I’ve ever made! You only need four ingredients, and five minutes of hands-on time. First, mix up sugar (I used brown sugar, because brown is better…sugar that is LOL) and cinnamon, and sprinkle on top of the thawed puff pastry. With a rolling pin, press the cinnamon-sugar mixture into the pastry. 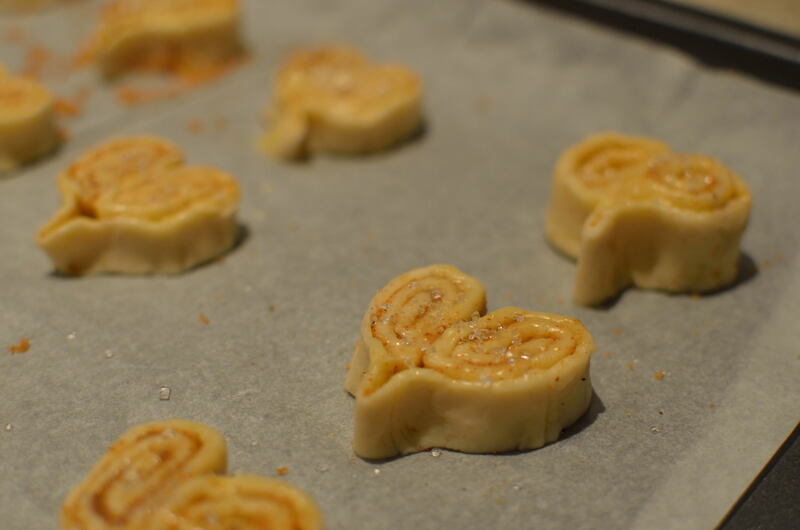 Next, roll in the two long edges toward the centre, and refrigerate for 20-30 minutes. Then, slice the log into 1/3-1/2 inch cookies, and pinch in the middles to make an exaggerated heart. Don’t worry if you pastry starts falling apart, just re-roll it. Brush with melted butter, and sprinkle with sugar (I had sanding sugar, so I used that, but I’m sure regular sugar would be great, too). Bake at 425 degrees Fahrenheit for 8-10 minutes. Then flip them over, and bake for another 3-4 minutes. I love adding cinnamon to things, because after I bake, the whole house is filled with the most comforting fragrance. You can use other additions such as orange zest, fruit jams, or nutella, instead of the cinnamon if you prefer, but these are just perfect as is! Now you have some yummy cookies to share! Thanks for coming by, have a great week! 1. 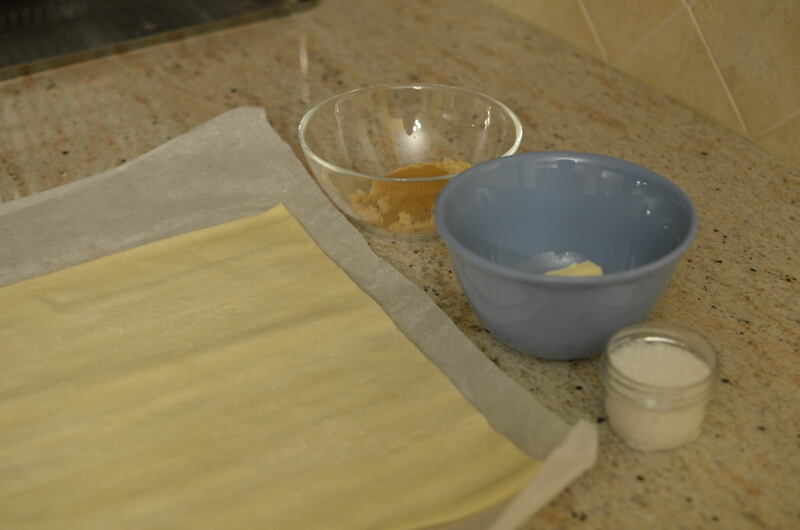 Unwrap the puff pastry and lay it on a clean work surface. Cover to prevent the dough from drying out and let it thaw until completely pliable but still cool. It’s very important that the dough be completely thawed before using. 2. Mix cinnamon and sugar. 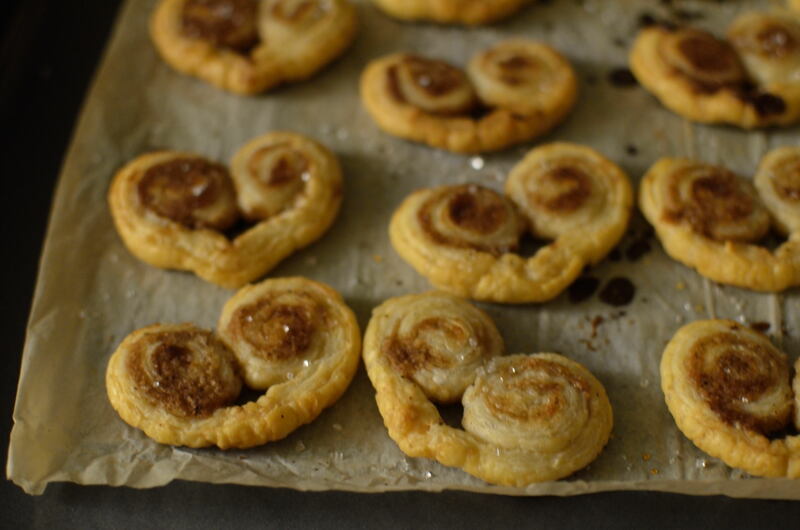 Sprinkle the cinnamon sugar over the dough in a single thick coating. 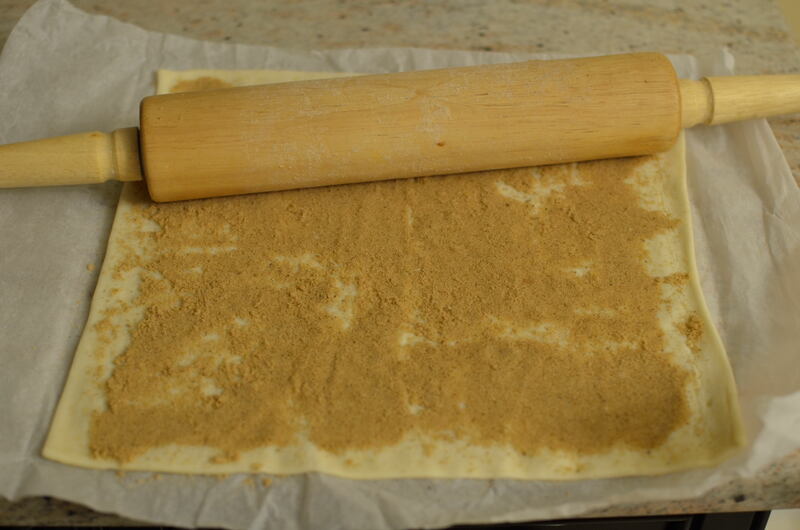 Run a rolling pin over the pastry to press the sugar into the dough and help it adhere. 3. 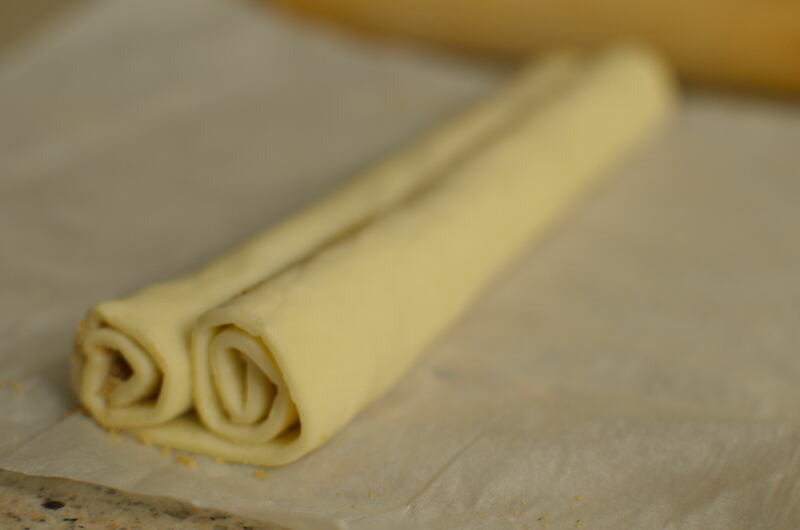 Tightly roll both sides of the pastry inward so they meet in the middle. Wrap the rolled log in plastic wrap and refrigerate 20-30 minutes. 4. Pre-heat the oven to 425°F. Place a rack in the middle position. 5. Use a serrated knife to slice the roll into cookies roughly 1/3 – 1/2 inch thick. Arrange the cookies on a parchment-lined baking sheet, allowing 2 inches of expansion room between each one. 6. Brush each cookie with melted butter and sprinkle a little more sugar over the tops. 7. Bake for for 8-10 minutes, then flip them over, and bake for another 3-4 minutes. Allow to cool for 10 minutes on cookie sheet. Store in an airtight container. Cookies will be less crispy but still delicious the next day. We’re at that time of year in University where there’s a lot going on that’s going to get you down. 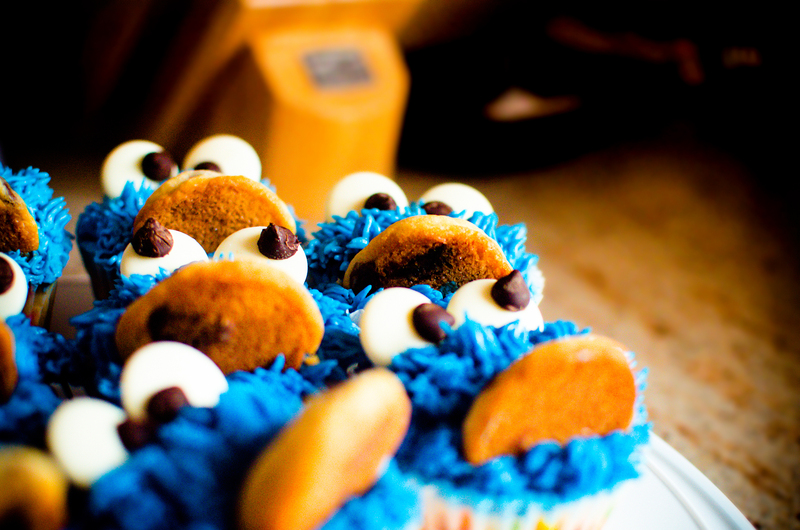 Sometimes, you need something to pick up your spirits and that’s exactly what baking can be. Today, I’ve got one of those simple, yet delicious recipes for you! 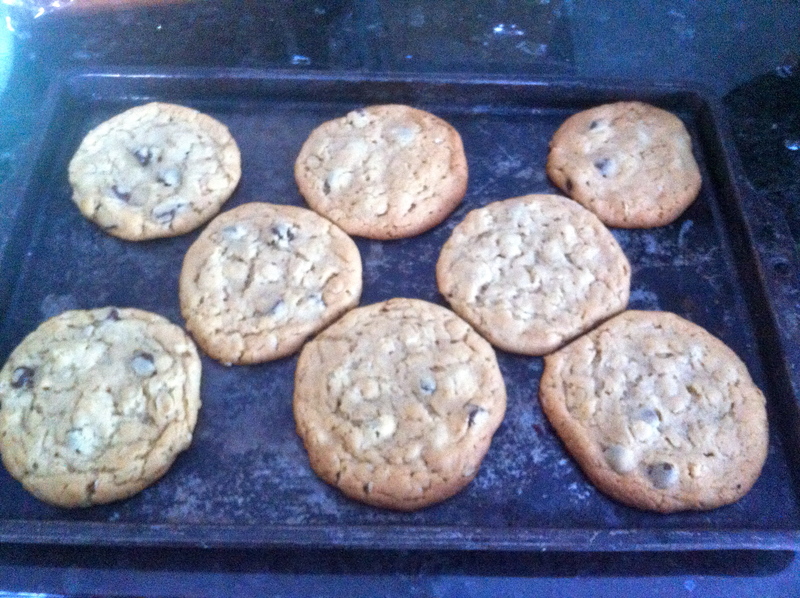 I’ve made these cookies twice in the last two weeks and they never fail to make me feel better. So try them out, I promise they taste amazing! 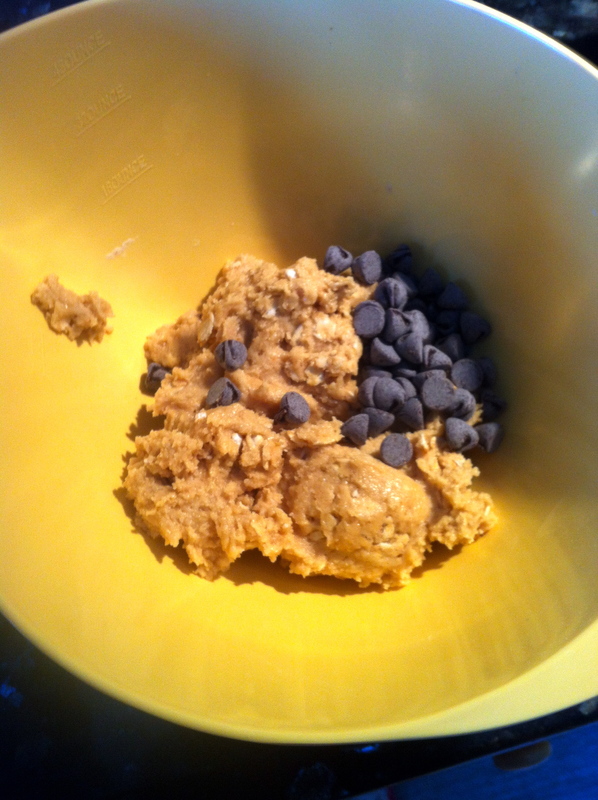 Mix together the margarine (or margarine and shortening), brown sugar, white sugar, and peanut butter. 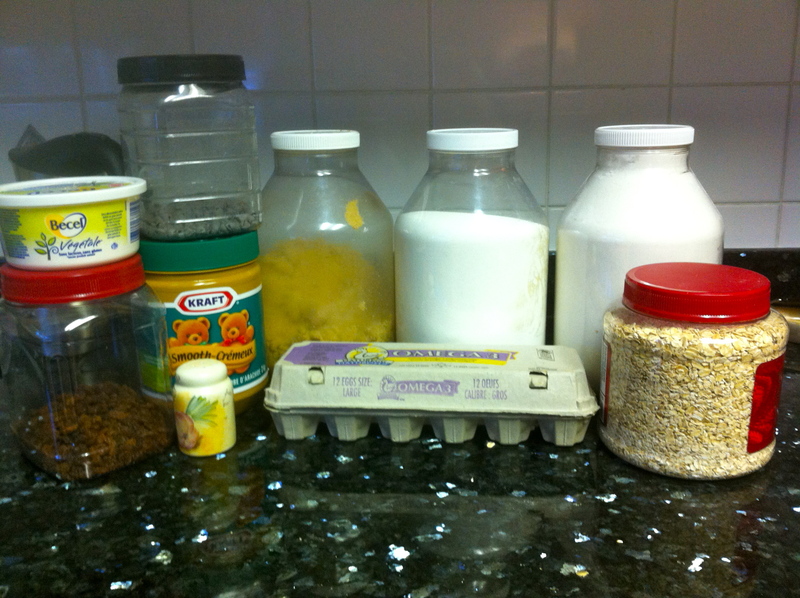 Add the eggs, flour, baking soda, salt, and oats. 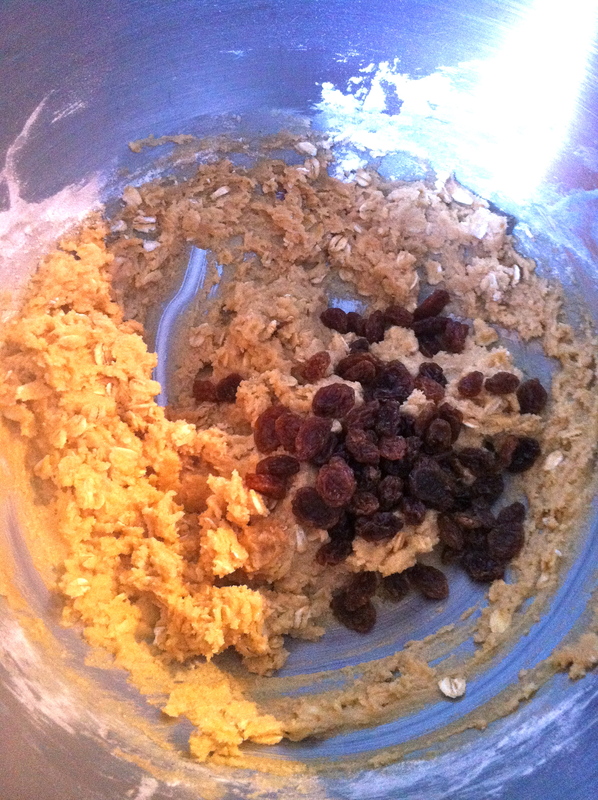 I decided to add chocolate chips into half the batter and raisins to the other. 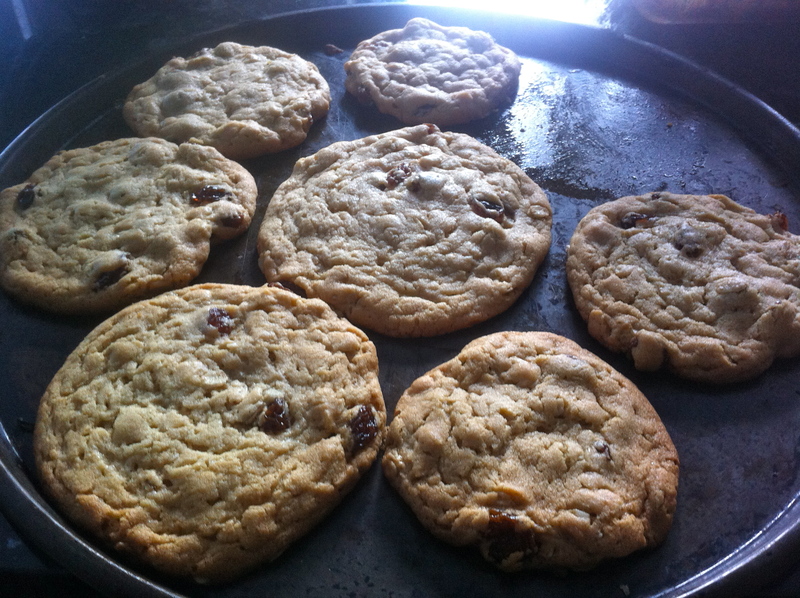 Drop by teaspoons onto an ungreased sheet and bake at 350F for 10-12 minutes until bottom of cookies are slightly golden. There you go! Try these out…you really won’t regret it. Bake for 10 to 15 minutes in the preheated oven, or until just light brown. 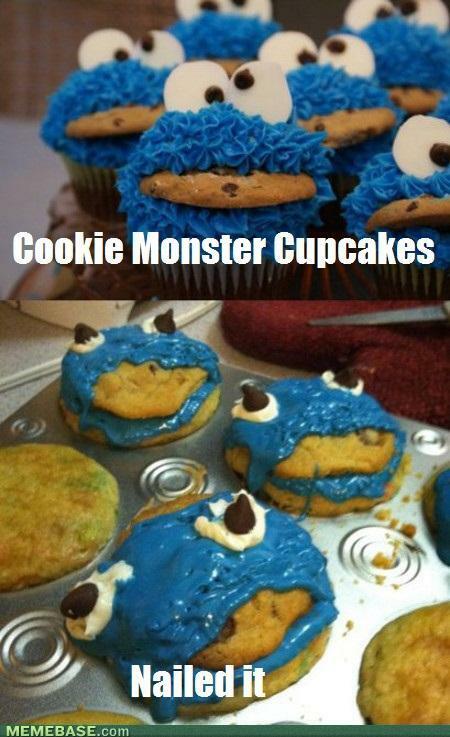 Don’t over-bake. Cool and store in an airtight container. 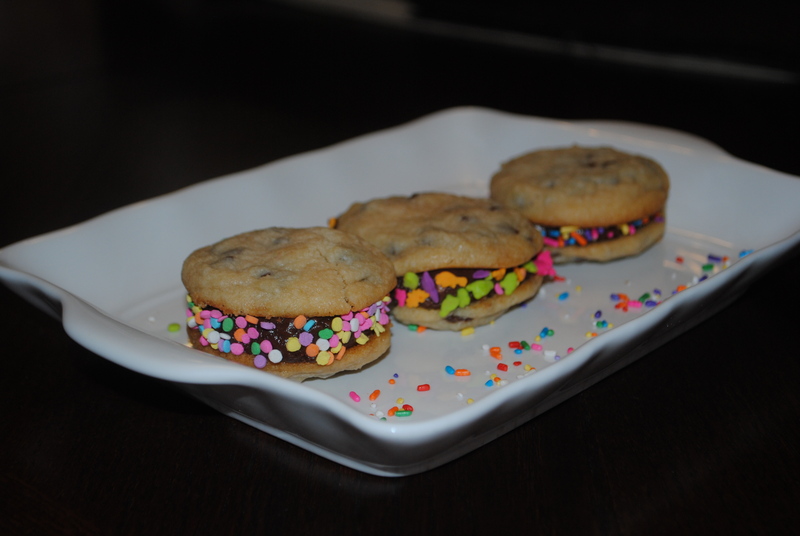 Chocolate Chip Sandwich Cookies for Christmas! You know how some days are just perfect? Days when it seems like the whole world conspired just to make you happy? I had one of those days recently. My class was cancelled last minute, it was my Mom’s birthday, I bought a super cute pink hoodie, and made Chocolate chip cookie sandwich cookies. All in all, a great day off in the midst of exam prep, presentations, and the madness that is student life! These cookies are perfect for Christmas time-they’re so fast and easy, and the whole family can get involved in baking them. I made these with IS-a family friend, using the recipe from Sally’s Baking Addiction, and the cookies turned out pillowy soft, and the frosting with straight up scrumptious! 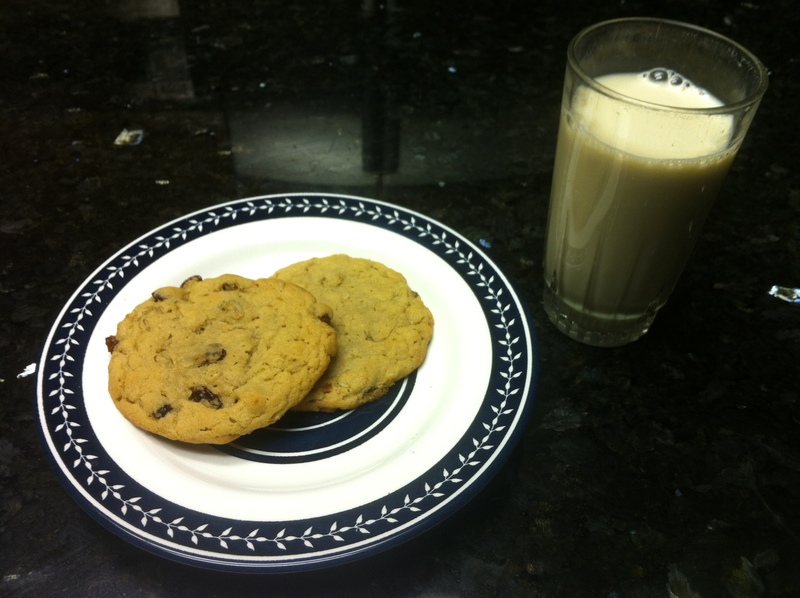 I personally prefer a chewy chocolate chip cookie though, so if I were to remake this recipe, I would use the Original Tollhouse Chocolate chip cookie recipe (it’s also included below). 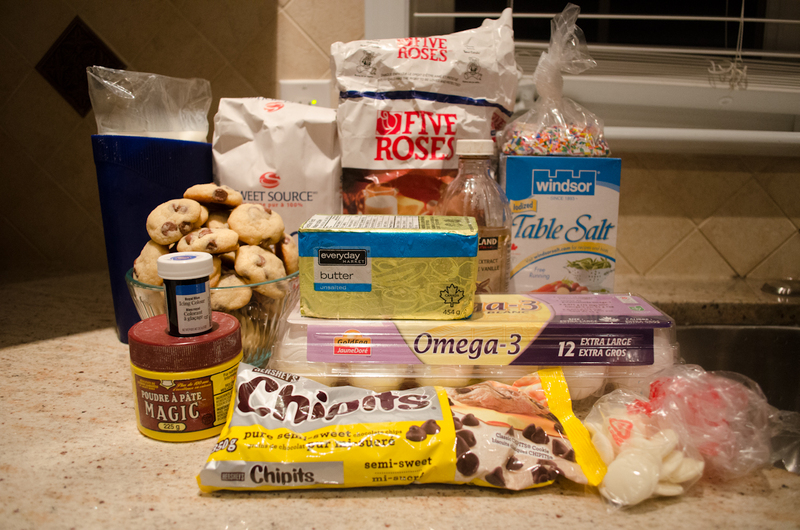 We made the cookies using mini chocolate chips, but feel free to use regular chocolate chips. 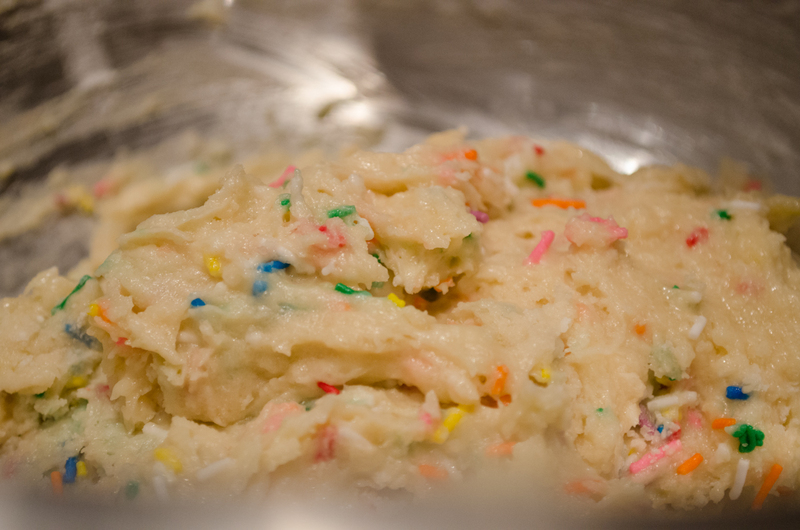 Of course, I found the need to add sprinkles to these cookies. We found these super cute dinosaur sprinkles that we used for some of the cookies! Feel free to try different flavour combinations like peanut butter chip cookies with nutella frosting in the middle, or chocolate cookies with white chocolate chips and vanilla buttercream…mmm that would be scrumptious! Especially with a warm cup of hot chocolate on a snowy day! These cookies were quick and delicious-clearly we couldn’t resist taking a bite! Thanks to IS for the pictures! S will be making something delicious next week and I’ll see you in the New Year! 1. Preheat oven to 375 degrees Celsius and line a baking sheet with parchment paper. 1. On medium speed, cream butter for a few minutes. Turn speed to LOW and slowly pour in the dry ingredients. 2. Mix until sugar/cocoa are absorbed by the butter. 3. Add the vanilla and salt, and then milk. 4. Beat for about 2 minutes or until the frosting reaches a desired thickness. 1. 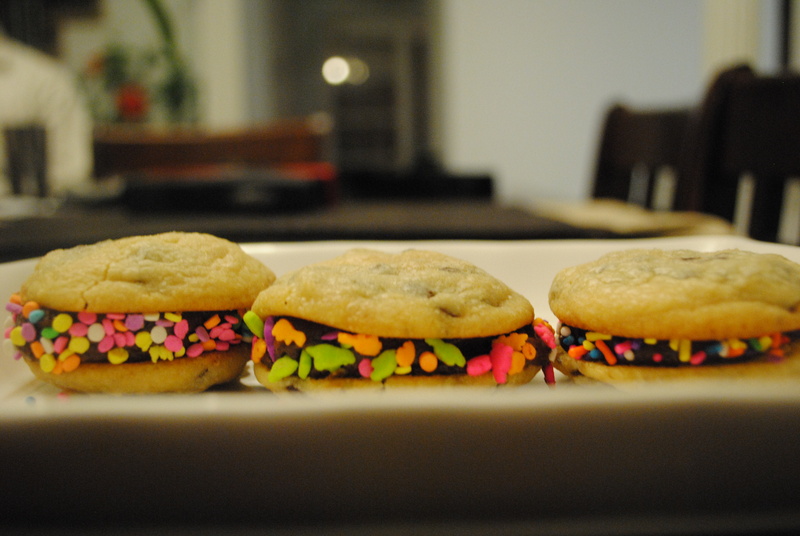 Pipe frosting onto mini cookies, and make the sandwiches. 2. Roll the cookie edges in sprinkles. Hey there! December is finally here and with it comes our favourite season of the year (minus the depression of finals). Today I made some simple cookies and just decorated them up festively. I tried out this recipe after making some butter cream frosting (check out our first cupcake post for the recipe) and had a motherload of egg yolks in the fridge. So I actually googled, “egg yolk cookies” and came across a recipe from food.com (http://www.food.com/recipe/egg-yolk-cookies-63803). There’s quite the unattractive picture with that recipe but trust me, they taste delicious. You don’t have to decorate these at all. But just in case, here are a couple easy ideas. I had been wanting to try out this snowman idea for a while (http://www.trulycustomcakery.com/tutorials/25.html). Usually, these are done with large marshmallows but all I had on hand were the mini ones so I tried it out. Just put them in the microwave for about 8 seconds and they’ll puff up and get sticky so you can put them onto the icing. I used some chocolate chips for mini hats and orange sprinkles for the carrot noses. The black and green are just icing with some food coloring that I put on with a toothpick. The rest of these cookies are pretty much randomness. I tried making a little Christmas tree with colored icing and then used some cupcake toppers that G got me last year to finish off the last cookie. Hope you guys have a fabulous week and be sure to check back next Sunday! 2. Add egg yolk and vanilla to creamed butter and sugar and mix. 3. In a separate bowl, whisk together dry ingredients (flour, baking soda and baking powder). 4. 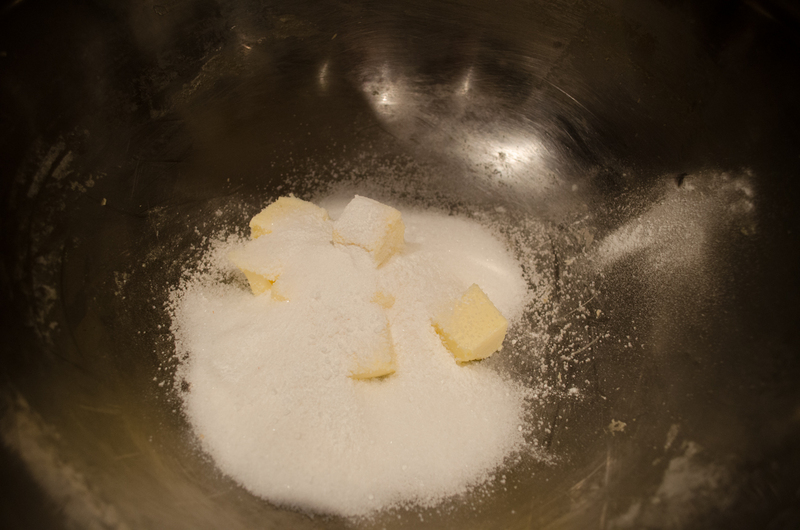 Add dry ingredients to creamed butter, sugar and egg mixture, mixing until well blended. 6. Bake at 350°F for 8 to 10 minutes. Check out https://sweetlittlebrownies.wordpress.com/2012/10/14/starting-off-with-cupcakes/ for a great frosting recipe.